GOBA is primarily a camping tour, although some communities might offer alternative lodging. Your registration includes primitive tent camping (which means no electricity or water is provided to individual campsites). All GOBA participants will be able to tent camp together in the one GOBA campground (usually a park, fairgrounds, school, or college campus), or in adjacent overflow camping areas. Shade for the tent camping areas is not guaranteed! 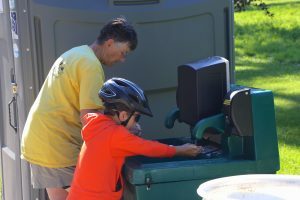 In the campground, you will find access to portable toilets, inside toilets and restrooms, free showers (inside a building or in shower trucks), drinking water, first aid, an information booth and usually food and beverages for purchase. It is against health and fire department regulations to have a fire or cookstove in the GOBA campground. Signs will be posted that will show you where our host facility has determined that no tents are allowed. If you have questions about this while on tour, please inquire at the GOBA information booth. 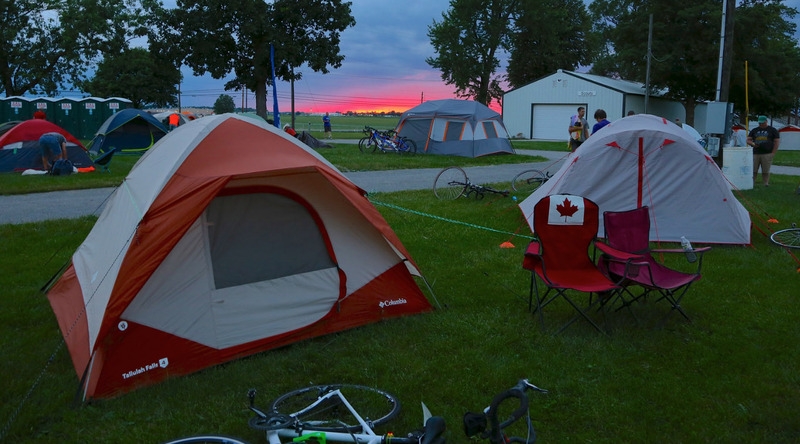 Quiet hours in camp are 9:30 p.m. to 5 a.m.
Route and town details subject to change; watch newsletters and GOBA.com for updates. For those who want to make their camping experience more convenient, be sure to check out our optional camper services, which include tent rental, tent setup, chair rental, luggage retrieval, fresh towel service and snacks and beverages. You also can camp in a vehicle or trailer by using a Car-Camper Pass. Fees for services and passes apply. • No alcohol in camp. No firearms in camp. • No smoking within 50 feet of any tent structure or where signs prohibit. • No animals in GOBA camp. • No fires, open flames, cooking, fireworks (legal or not) in GOBA camp. • No vehicles within 20 feet of any tent. • Local fire codes do not allow camping inside buildings unless specifically designated for this. You will be asked to move if you do not observe this rule. Or local fire officials may require us to do this for you. • Do not block fire lanes. • Pitch your tent only in designated areas, or you will be asked to move. If a significant safety issue is breached by the location of your tent (such as in a marked fire lane), your tent will be moved for you. • You are requested to maintain 5 feet separation between the three tents on your site and 10 feet from the tents on the adjacent site. • No dumping of gray water on the ground. Use designated receptacles. • For first aid in camp, seek assistance during the day from local first aid set up near the GOBA medical RV; during the night from the GOBA medical RV. • A local law enforcement officer will be in GOBA camp around the clock. He or she can also help you locate emergency assistance. • Wear your helmet at all times while riding your bike, even in camp. • Riders’ vehicles will be allowed in the designated car-camper or other designated parking area. No vehicles other than GOBA official vehicles are allowed in the tent camping areas. • If using walkie-talkies in camp, please avoid using Channel 10, the GOBA operations channel. • Quiet hours are 9:30 p.m. to 5 a.m.
• No generators running, including in the car-camper parking area.